Boss Carlos Carvalhal praised his Owls side’s character after they handed him the perfect birthday present. 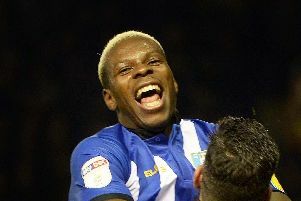 Wednesday beat Preston North End 2-1 in a crazy encounter at Hillsborough on Saturday which saw three red cards. The Owls clinched back-to-back victories, despite losing Ross Wallace (back/hamstring) and skipper Glenn Loovens (dead leg) in the first half due to injuries. Substitute Will Buckley also played through the pain barrier after suffering a shoulder problem in a collision with Preston goalkeeper Chris Maxwell which culminated in an Owls penalty. Carvalhal, who turns 51 today, said: ”When we played with just 10 players, our team showed how much they want to win and the quality of the group. They did fantastic team work and we achieved the second goal. “Buckley then picked up a problem in the shoulder and we stayed with nine players so it became more difficult to cover all the spaces. At that moment, Preston scored and went 2-1 up. “We closed the spaces and tried to protect our goal and we had nine and a half players as Buckley’s body was just there as he couldn’t move too much. Although he was delighted with the way his side overcame several setbacks, Carvalhal was unhappy with the referee’s performance. “If I talk, maybe I will be fined,” he said. The Portuguese chief thought Fernando Forestieri’s dismissal was the “correct decision” but admitted he didn’t see the incident involving Preston duo Jermaine Beckford and Eoin Doyle. The strikers were red-carded after they fought with each other in added-on time. Left-sided Owls player Adam Reach, who spent the majority of last season on loan at Preston, said: “I’ve never seen anything like that before. “It was a little bit stupid on their part. “They are both very professional and experienced, but it is how much it means to them.